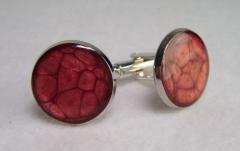 Our Silver Plated Cufflinks come in two sizes, these are the 'large' size. In the centre of the bezel setting, we have hand applied Cold Enamel in gorgeous mottled Crimson red. Jewellery and accessories designed especially for the men in your life.